To dance. Is there anything so elemental to human creative expression? With the barest of props – merely a song in their minds – children intuitively know the joy of such movement. 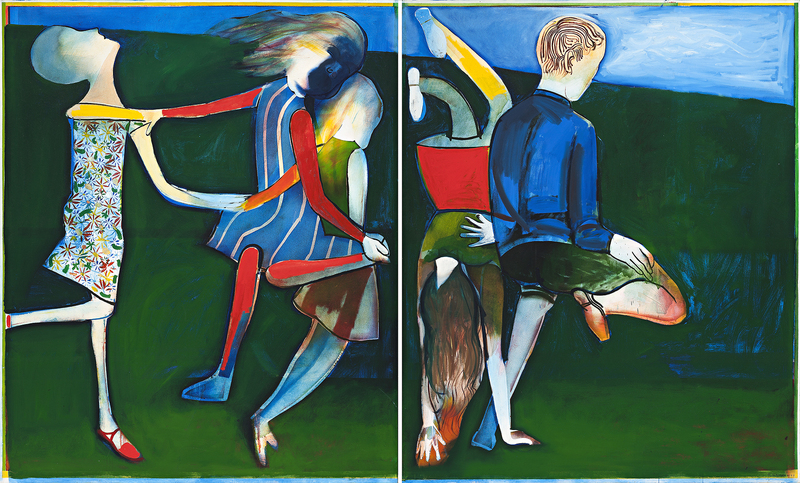 In Leaping Children, 1968, Charles Blackman, one of Australia’s most enduring chroniclers of childhood ritual and experience, captures one such moment, a life-sized diptych of five young dancers lost within their private whirl. One girl gives in with such abandon that she has flipped during her trajectory and now stands on her head, inverted, like Alice through the looking glass. In a painterly sea of green and blue, this image is also one of homecoming and sunlit sensation, a joyous response to Australian life by an artist reconnecting with his homeland following five years based in England. The Blackman’s new home was in Attunga Ave, Woollahra, in Sydney’s eastern suburbs, and Charles quickly set to work building a huge studio on the upper floor of the house. In this endeavour, he was assisted by Halifax Hayes, ‘(a) Charles Atlas, mountain of a man, (who helped) realise the artistic visions of the diminutive Charles. Hal's physical strength and Leonardo da Vinci mind complemented Charles' intelligence and mercurial, restless spirit. They forged a rare bond in deep friendship’.1 One of their major projects was ‘the creation of the formidable floating easel’2 which allowed the artist to work on an increasingly large scale. From its elevated position, the studio had sweeping views over the suburb, and also looked over ‘a wonderful garden which two very fine gentlemen had manicured into a beautiful thing’3 which became the inspiration for a concurrent sequence, The White Cat’s Garden. Other subjects focussed on the family at leisure at the nearby beaches, harbour pools and parks, or relaxing with Blackman’s mother and stepfather at the central coast town of Ettalong. It was an extremely happy and productive time and optimistic energy radiates from Leaping Children. However, as with all works by the artist, there is mystery flickering at the edges. The children are absorbed in their group frolic but apart from the physical connection of held hands, each figure is enveloped by an interior mood, faces veiled or turned away from the viewer and from each other. Their movement is conveyed by blurred edges and blended fields of pigment, heightened at key points by sharply incised lines, as if moments within their passage have been highlighted or temporarily frozen before dissolving once more into the dance. 2. Auguste Blackman, op cit.